The ancles or false chameleons of the Americas show numerous relatives in the various South American forest regions. This Costa Rican species lives in the forest regions of Central America. The tail tends to be three times as long as the 4- to 6-inch body and serves as a balancing organ when the animal climbs, rather slowly, in the forest canopy. The extensive toes of the widely spread hindlimbs let the lizard clasp branches. Thus these animals can retain a firm grip with the hindlimbs when only these are in contact with a branch. Several species of the group show some sexual dimorphism in coloration. In such forms the males are characterized by almost uniform dark green to brownish patterns, while the females are marked in various patterns of browns, whites, and blacks having the capacity to become green when excited. 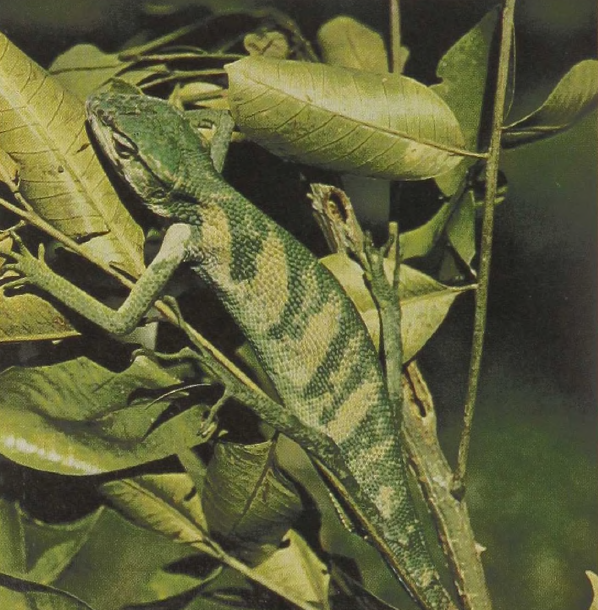 Numerous other genera of forest iguanas occur in South America with each type represented by only a few species in a generally restricted range. These small lizards feed on arboreal insects and all lay eggs in the ground.